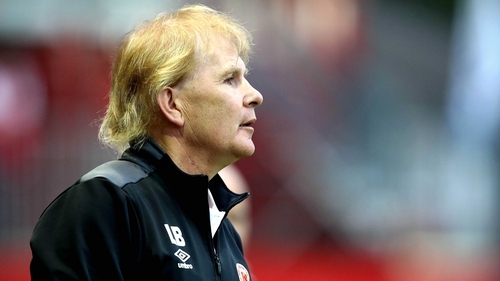 Sligo Rovers have confirmed the appointment of Liam Buckley as their new manager. The former St Patrick’s Athletic boss will join the Bit O’ Red on a one-year contract having won two Premier Divisions, two FAI Cups and two League Cups in his management career so far. The new Rovers boss will meet supporters for the first time tonight as he attends the game against Shamrock Rovers and will be presented to the crowd at half-time. He will officially join on 1 November. Buckley said: "I’m really happy to be here. It’s great opportunity for me and I’ve always loved my games at The Showgrounds. "It’s a footballing town. I think there are players here that are technically good. I want to improve them and the club and see where it can take us." Heraghty stated: "From the outset Liam was our number one choice for the role. His record is outstanding in the League of Ireland and the brand of football he brings with it is renowned. We’re delighted to reach agreement for him to join us. "It’s our intention that 2019 is a big year for Sligo Rovers. We know this appointment will excite our supporters and the committee encourages everyone at the club to get behind Liam. "To attract a manager of Liam’s ability shows the potential at our club and we really feel he is the man to help us improve our league position for 2019 and bring exciting nights to The Showgrounds again." Buckley's backroom team will be confirmed at a later date.